It is with great excitement that I write this letter to you as part of the Inaugural GSC Newsletter. This newsletter, courtesy of our House Committee led by Richard Fulton, Jon Erensen, James Mairs and Lee Milazzo is but one of the many developments I look forward to sharing with you as the 2018-2019 hockey season quickly approaches. I am happy to inform you that the newly elected Board has approved a working budget for the coming season and will keep dues and hockey fees unchanged for full members. GSC's finances continue to be in excellent shape thanks to active participation across all club programs. As such, the Board recently authorized a substantial payment toward the amount of principal owed for the construction project. The Club remains on track with its original plan to eliminate our mortgage loan entirely in the next few years. Thanks to the hard work of our Admissions Committee under the guidance of Neely Vanneck, we welcomed over 30 new families to the Club this season and our waiting list remains robust. Please remember to continue to introduce local friends and their families to GSC. There is no one better than a current member who understands the magic that GSC holds to promote the Club. The GSC Board continues to work to provide our players and families with the most unique and awesome hockey and clubhouse experience. To that end, we have approved a new GSC Team Room project. We will renovate the big room upstairs in the Clubhouse which will provide figure skaters, hockey players and coaches with additional space for workouts, film sessions and team meetings and, in addition, provide parents and families an area for team dinners and parties. We look forward to getting a lot of use out of the new GSC Team Room all season long. This coming season, we will run the Travel Development League (TDL) as a full season program starting in September. The TDL provides tremendous skill development and an opportunity to represent GSC in the WesConn Hockey league against teams from Darien, Stamford, Rye and Shelton. We will run 2 teams, each practicing 2x per week and playing one game each weekend. Last year, we had 34 players participate in the TDL and we are proud to announce that 5 of those players have earned a spot on Travel rosters for this coming season. This summer we are running a Summer Goalie Series along with ProCrease. This program will allow current goaltenders to train and further develop their skills while providing an opportunity for younger boys and girls who might be interested in goaltending to give it a try. Goaltending numbers are an issue at many area programs and we are dedicated to grow our goaltending base right here at home. Please reach out to Brent Brower, Jason Price or Harry Schwefel to find out more about our Goaltending program including ProCrease, the Summer Series, and subsidized equipment and hockey fees. Jenn Leary and Ingrid Hang, our co-Heads of Figure Skating are happy to announce that this year, we will be adding three classes to our Monday evenings. Yoga & Stretching for Figure Skating is a new off-ice class that will make use of our new GSC Team Room! The return of Basic & Advanced Moves in the Field will help our skaters continue to improve their fundamental skating skills, incorporating power, edge work, quickness and flow into each skating element. For hockey players, High Performance Power Skating will be back on Tuesday nights after a successful launch last year! The aforementioned House Committee is already busy working to bring our families and players great experiences this season and beyond. In addition to our Team Room project, we look forward to an enhanced Social Calendar including GSC Games of the Week, a new Social Media presence including game highlights and GSC Wing of the Week and much more. Please visit our new and improved website to see a list of our Board Members and Committee assignments. Committees will consist of Board Members and non-Board Members so please bring your thoughts, ideas and volunteerism to Committee Members and get involved on behalf of all of our hockey players, figure skaters, coaches and members. GSC provides us all with an ideal experience of competition, fun, family and community. Our membership’s enthusiasm and hard work will only enhance that experience for all involved. 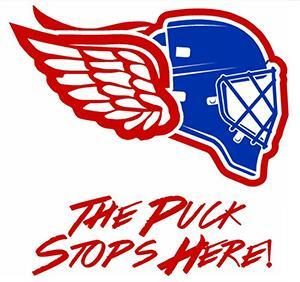 Enjoy the rest of your Summer...........GO WINGS!!!! Did you know we have one of the best goalie programs in Connecticut? The Hockey Committee would like to share our program information with everyone to ensure our members understand the Club’s commitment to goalie development and the opportunities this program brings to all members. Our goal is to continue to produce talented goalies for our boys and girls hockey teams. We encourage at our younger ranks to have children rotate playing goalie as they develop core skating skills. GSC will provide all the necessary equipment to our Mite and U10 teams so more any interested player can experience our program. To continue to expand and make our goalie program better, we are creating a Summer Goalie Series for members that are in the area this summer for existing goalies to further develop their skills and for members that are interested in learning how to play goalie. We are also currently looking for a U12 and U14A goalie. If there are any girls at the club that would like try goalie, the Summer Goalie Series is a great way to transition into this position between seasons. Please contact Brent Brower at for more information on this exciting program. Below are details on our current goalie program and Summer Goalie Series. Equipment: The club will provide goalie equipment for each session. Training: Weekly goaltending clinics run by ProCrease coaches, with a 3-1 coaching ratio. ProCrease goalie coaches will also visit each team practice 2 times per month to work with goalies. GSC also has several goaltending coaches at the club and private lessons are available. Training: GSC will host 4 ProCrease Goaltending Clinics this summer. Each clinic will be one hour each at the Terry Conners skating rink in Stamford, CT. The GSC website has a cool new look! We spent some time this summer re-skinning the site. Look for great new content as the start of the season gets closer. 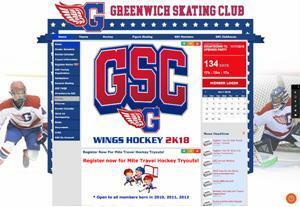 The monthly newsletters can be found under the GSC Members tab. GSC finally has an official Facebook page! Please click on the link below and ‘like’ our page. We will be posting photos, game scores and interesting articles about hockey, skating and other topics relevant to GSC. The page will be administered by the house committee and will not allow comments. This page will be a great public way to promote the club and the great family atmosphere we have cultivated. GO WINGS! We have also connected the club’s schedule with SportsYou, a portal for the 2018-2019 season! We are excited to introduce our initiative to connect all of our club members to each other and celebrate all of the great things that will happen over the upcoming season. This is a portal that will foster an environment of shared experience between your team members and throughout the entire GSC family. This is a place to share great goals, assists, wins and tough losses (hopefully not too many). This tool will help develop our sense of community and build a strong GSC hockey culture for our players and families. The portal will also serve as a place to keep track of games, practices, events, coaching communications, and many other important messages. Please sign up for the app (available for Apple iOS and Android) and we encourage you to take videos, photos, and share stories so we can all partake in the celebration of your players and teams! We’ve attached a PDF that has all of the instructions for logging in and registering for your team. It should be easy and lots of fun!